Looking for a delicious gluten free gravy to add to your turkey and gluten free stuffing? Well, you are in luck because there are a variety of brands to choose from. Maxwell's Kitchen makes a Turkey Gravy Mix. This is available at select health food stores in California, Colorado, Connecticut, Delaware, Illinois, Indiana, Iowa, Maryland, Massachusetts, Michigan, Minnesota, New Hampshire, New Jersey, New York, Ohio, Oregon, Pennsylvania, Rhode Island, Texas, and Virginia. You may also purchase this Turkey Gravy Mix at Ms. Celiac's Market. For more information on Maxwell's Kitchen, please visit maxwellskitchen.com. Another company that makes a tasty gluten free gravy is Imagine Foods. 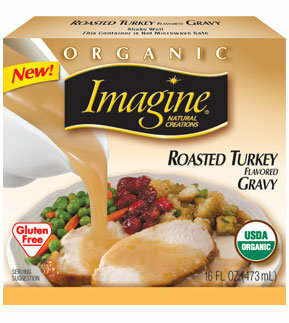 Their Roasted Turkey Flavored Gravy is made with the finest organic ingredients and real turkey. It is available to purchase online at their website, www.imaginefoods.com, and at a variety of health food stores and supermarkets. There will be no post tomorrow or Friday due to the Thanksgiving holiday. I hope everyone has a happy Thanksgiving!